I created my page using Art C Ultra Chalky Paint in Sand, Victorian, and White for the background. 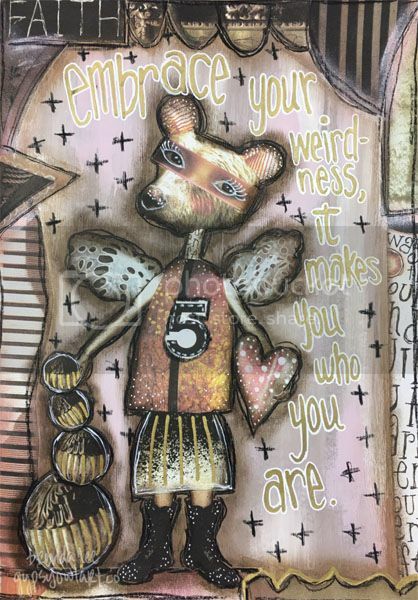 I then added my collage elements and used Faber-Castell Gelatos (Iced Mocha and a metallic pink from their metallics set) to create the shading. My trusty Stabilo All pencil (what on earth did I do before discovering that pencil?) of course came out to play as well as a White Linen Dylusions Paint Pen and a Gold Sharpie paint pen. This page was made in one of my ongoing Dylusions journals. I did not prep the page in anyway. Ok, so one of the biggest notes I should make about my page versus the kit picture is the color difference. I have an inkjet printer at home that no matter how hard I try or what paper I use, it always prints far duller than the actual colors. In some instances, like this page, it works out fabulously and gives it something completely different from everyone else's samples. It's also a really easy way to tell if the page is mine and cut-n-paste versus digital. Mind you, however, if I happen to print from work we have a laser printer there and the colors will be much more vibrant. This was a super fun kit to use and out of all the fabulous pieces, I just had to use that little bear head. It was definitely my favorite!! If you've never used or purchased "digital collage kits", the way it works at Mischief Circus and in particular with Crowabout Studiob kits is you purchase your kit and then download it to your computer. There are several zip files to download such as "parts", "bodies", "collage sheets", "papers", etc. It just depends on what all is in the kit. Download them all and put them on a jump drive (that's what I do anyway). It is now yours forever. Most of the Crowabout Studiob kits come with "Collage Sheets" where Nancy has already thoughtfully put together all the separate elements into handy printable sheets. Every now and then I want to use a particular element that I want bigger than it comes on the handy printable sheet. What I do then is to open that element in PhotoShop and size it however I want and then print. That way I can get some really big elements if I want to do a larger page or manipulate them in any way I want - such as if I want legs or faces to be going in the other direction. If you don't have PhotoShop, you can actually insert them into a Word document and manipulate them that way. Of course.... if you're in PhotoShop (or another equivalent program), you can simply create a digital page and not print anything!! Or print it and then add it to a block of wood, or a canvas, or some other creative type thing. Nancy has actually printed some of her girls onto canvas and created the most adorable Art Dolls. I actually would love to try that one day. Have no clue how to do it, but I'll give it a go one day. So that was my first ever page as an official Creative Team member!!! I hope you enjoyed it, and if you're intrigued, show Nancy some love and purchase some of her kits. You won't be disappointed and you'll have lots of fun playing!